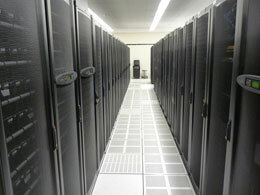 Mynex provides colocation services to Chicago and the Chicago suburbs. This service provides your company with rack space, power, bandwidth, and security. You provide the hardware and can install a server architecture that meets your exact needs. You get an enterprise class data center and redundant high performance Internet connections. You also get an experienced staff working with you to configure or manage your colocation solution when help is needed. You can lease advanced managed services with colocation including firewalls, data backups, and other advanced managed services. Our datacenter meets the highest standards and has N+1 redundancy built into the center's infrastructure. This ensures that your mission critical solutions are performing 24/7/365. It is also SSAE16 Type II and PCI compliant to ensure your data is always protected. Rack space is sold by the U (1,2,3U...), or by the 1/3 rack (14U), 1/2 rack (21U), or Full Rack (42U) configuration. Standard 19" racks that fit most standard rails. If you don't have rails, a shelf can be provided for a small monthly fee. Our datacenter provides your PDU and UPS systems when you colocate your equipment with us. Datacenter grade equipment is used throughout the facility because it offers a high reliability infrastructure. 20 Amp circuits in both 120V and 208V are available depending on what power feed your equipment needs. Each of our datacenter's full racks can handle up to 60 Amps (3 x 20 Amp Circuits) with A/B redundancy when needed. This flexibility allows you to grow into your rack and add power as you need it. You can also purchase power by the single Amp if you have smaller configurations. Our datacenter has fully redundant Gigabit (1000 mbps) connections to the Internet. Multiple Internet providers and unique physical exit points out of the building ensures that there is no single point of failure. It is also known for low latency bandwidth and its lines are never saturated like many of our competitors. Clients can burst to 100 mbps but this can be limited or increased for better control on their bandwidth. The datacenter's network is BGP routed and their backup lines automatically re-route in case of a failure on one of the lines. Bandwidth charges can be based on either the mbps (via 95th%), or by the GB transferred (usually better for low bandwidth users).